With the region full of Oregon Country Fair attendees it may look a little strange when lycra-clad cyclists take to the streets and country roads July 13-15 as part of the 2018 Cycle Oregon WEEKENDER. Cycle Oregon&apos;s 2017 CLASSIC was scheduled to make several Lane County stops, but was cancelled due to forest fires and smoke along the route. So, the 2018 WEEKENDER will provide riders a glimpse of Lane County&apos;s amazing cycling. The University of Oregon plays host to participants who can choose a dorm room, a plot of land to tent camp or a spot to park an RV. Each rider has the opportunity to choose a route, ranging from 17 to 72 miles, that matches their interest and ability. Riders return to expertly prepared dinners, a beer & wine garden, live music and more! Cycling in Oregon continues to grow and has become an economic engine, driving more than $400 million in annual spending. Also contributing to the economy, and funding dozens of projects around the state, is Cycle Oregon&apos;s grant programs. 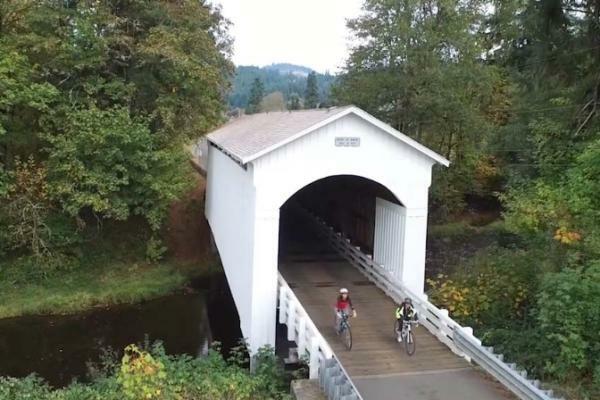 Offering two grant programs, the Cycle Oregon Fund, "helps preserve and protect the special places of Oregon and supports community development projects in the regions through which we ride."